From a very young age, Cindy knew that she enjoyed caring for others. She began her career in North Carolina, her childhood home. As an LPN she gained experience in a hospital setting, working on Critical Care and Medical/Surgical wings. 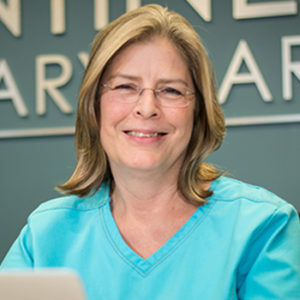 She has also worked in a variety of areas including Long Term Care, Skilled Nursing Facility and Primary Care Practice. In 1993, after following her husband up and down the eastern seaboard for his various job opportunities, she and her young family had the opportunity to move to Raleigh. There she remained happy to be back in her home state with her husband and their two children. Her daughter is now a Registered Nurse and her son is now a Health Fitness Specialist. Cindy enjoys spending time in her large vegetable garden, walking her 3 dogs, and boating and fishing with her husband on Falls Lake.